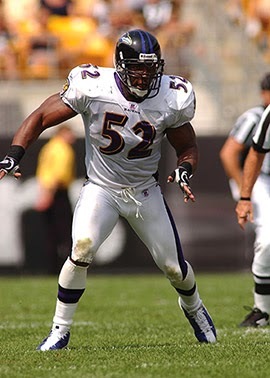 Lewis was chosen by the Ravens in the first round of the 1996 NFL draft, was inserted into the starting lineup at middle linebacker as a rookie, and had an immediate impact. He was chosen to the Pro Bowl for the first time in ’97 and was a consensus first-team All-NFL selection in 1999. With outstanding instincts, intensity, and speed that allowed him to cover a large area and make plays, Lewis was well-established as one of the premier linebackers in the NFL. The only concerns about him pertained to off-field issues following the ’99 season surrounding an altercation outside an Atlanta nightclub that ended in two stabbing deaths, but after a plea bargain that included his testimony against two associates (Lewis was also heavily fined by the NFL), he was back in action in 2000 and received NFL Defensive Player of the Year honors from the Associated Press as the Ravens went all the way to a Super Bowl victory. Lewis was a consensus first-team All-NFL selection for the third straight year in 2001 as well as Pro Bowl choice for the fifth consecutive season. He adjusted well to a shift to inside linebacker as the Ravens switched to a 3-4 defense in ’02 but he was limited to five games due to a shoulder injury. Ravens went 10-6 to finish first in the AFC North while leading the NFL in sacks (47) and fewest rushing touchdowns (6, tied with Tampa Bay). Lost AFC Wild Card playoff to Tennessee Titans (20-17). Other than 2005, when a hamstring injury cost him significant playing time, Lewis remained a regular Pro Bowl choice through 2011, his next-to-last season at age 36. Overall, Lewis played for 17 years, all with Baltimore, and recorded 41.5 sacks, intercepted 31 passes, and was credited with over 1500 tackles. He was a consensus first-team All-NFL selection seven times, received at least some second-team recognition after four other seasons, and was chosen to the Pro Bowl on 13 occasions. Lewis capped his career in 2012 by playing in another Super Bowl, also won by the Ravens.